If any one of our professional services do not provide satisfactory results, simply tell us. As your locally-owned and operated Lawn Enforcer, we will return and redo that service at no additional charge or refund the full cost of that particular lawn care service. At Gulf Coast Lawn Enforcement we provide professional lawn care service that is affordable for everyone. The Basic Package includes mowing, edging, trimming, and blowing. 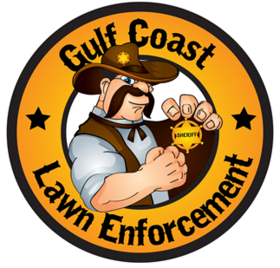 Our most popular package allows Gulf Coast Lawn Enforcement to take your lawn care by the reins and maximize curb appeal. The monthly premium package includes the Basic Package + weekly care of shrubs and flower beds. GCLE will maintain appropriate shrub heights, treat unwanted ant beds and keep flower beds weed free. The Monthly Premium Package includes 15% discount on all added services.